Welcome to the Gallery of Promises where Magicians pledge to keep Piddington's Secrets Secret. You will see them here photographed with their Sincerity Contracts. Add yours by emailing a photograph of yourself and your signed sincerity contract to Promises@ThePiddingtons.com where you promise never to reveal Piddington's Secrets, never to lend. sell-on or divulge the book. 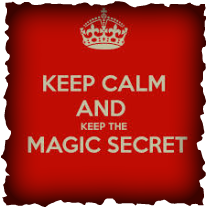 January 2015 - Magicians keeping Piddington's Secrets Secret are: . . .